Yesterday when I was sitting in traffic on my way to work, I was wondering what other people think about when they are caught in traffic. Do they get angry or annoyed or do they perhaps take advantage of the time and have a language CD in the car - repeating "jag vill ha en banan" - "I want a banana" in Swedish. I must admit, i mostly get annoyed. I have to be at work at 8am and if i am not, more often than not, i miss out on a parking spot. 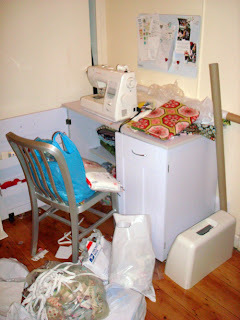 Ok, I see on other people's blogs their fabulous creative spaces. I thought i'd share my not-so-fabulous space below. Pretty impressive, huh! Something to strive for don't you think? On an unrelated note, have you ever been run over by a 7 year old child? I am not sure if it's something to boast about, but it happened to me yesterday. Let me tell you, they hit a lot harder than you think. If it wasn't for my friend coming to my rescue i would have landed flat on my face. Before I sign off, I thought I'd share this picture of my daughter and her take on modelling. In case you need help interpreting it - she is a lion! 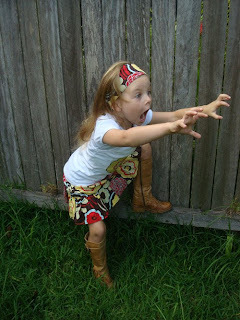 Rawwr!!! Love the pic of your daughter in her boots! PS - Thanks for the link to your store and your market dates. Very helpful when planning a Sydney visit!! I know Jen, i have found myself thinking about what to write about so i think i may have been bitten by something, lol. Thanks for the suggestions about links as well! Kul att det går så bra för dig! Det förtjänar du verkligen!! Hi, I am also brand new at blogging, and dont post all that often either. It's nice too though isn't it. All friendly and crafty... I will check in again to see your lovely clothes. Du är så duktig Jennie, verkligen! Jättefina kläder m.m. How lovely that you are getting all these Swedish visitors. I just need the translation now!! If you don't already know, Miss Cherry Stew is the designer behind the Cherry Stew label, I own several of her pieces (all unique and very detailed) and have met her in person. You are developing a following! Hi Jasperboy, basically the swedish comments are all about how great i am, hehe. Yes, i went into Miss Cherry Stew and had a look after she left a comment and saw your comments there. This whole blogging thing is huge and i am having a lot of fun checking everyone else out, i love it! Not leaving much time for sewing though, lol. I just keep looking at Ivy's room and it's just stunning, i want to buy the bookshelf from you, lol. I will see you at Mathildas! Yeah, I picked out a few words that I could understand. Jen.....best....swedish.....designer......ever.......the.......funniest.......too. My swedish is improving, yes??? Jasperboy, you are cracking me up!!! Yes, you are spot on with your Swedish, lol.